I made a thing. 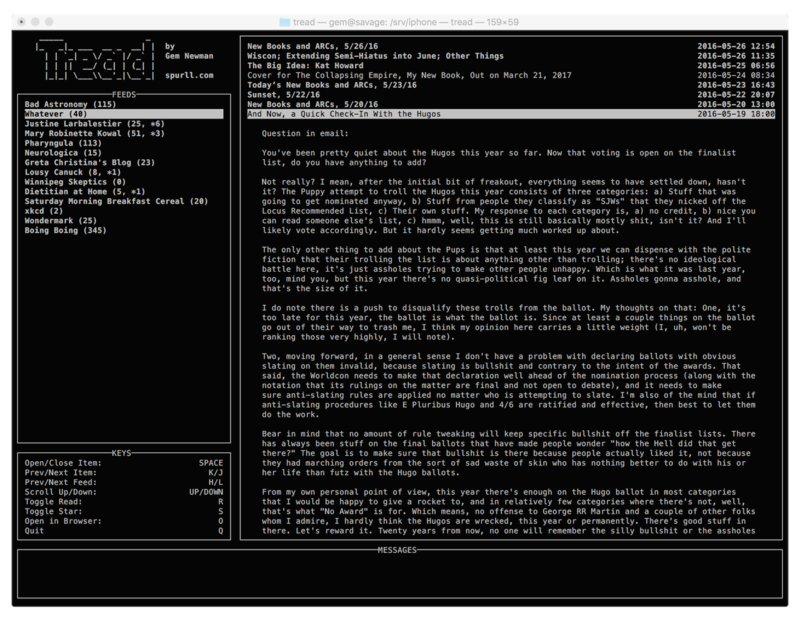 It's called tread, and it's a simple terminal RSS feed reader that I wrote in Python. tread has most of the basic features you would expect from a feed reader, including read/unread tracking and starred items. It even supports displaying images via imgii. And if you don't mind fiddling with a YAML file, it's also fairly configurable. The source code, along with the readme and basic usage instructions, is available here. (But fair warning: the code is awful, and you don't want to look at it too closely.) I do not guarantee it to be bug-free (in fact, I guarantee the opposite! ), but if for some reason you want a Google Reader replacement that runs in a terminal window, I've got you covered. Because of some esoteric requirements of curses (the most aptly named library, as bcj is fond of pointing out), tread requires Python 3.5 and does not run natively on Windows.